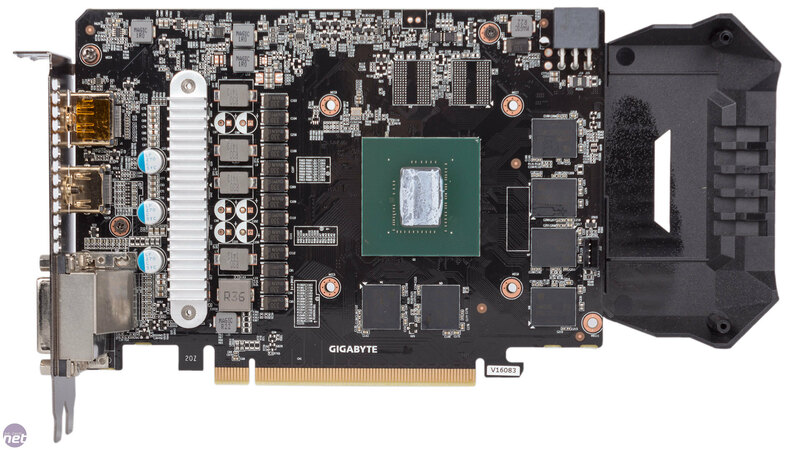 It was back in August that Nvidia first unveiled the GTX 1060 3GB, although today is the first time we're looking at one. The nomenclature is cheeky on Nvidia's part, breaking the norm of naming GPUs based on the number of cores they have. The GTX 1060 3GB is not just a standard GTX 1060 GPU running with half the memory, as Nvidia also disables one Streaming Multiprocessor (SM), reducing the count of cores and texture units. What this does enable Nvidia to do is offer it for a fair amount less than the 6GB parts, with a £180 starting price compared to £240. Since this is our first GTX 1060 3GB review, we'll briefly run down the GPU specifications. It uses the same 200mm2 GP106 GPU as the GTX 1060, built on a 16nm process and sporting 4.4 billion transistors. However, it is not fully enabled this time around, with the SM count dropping from 10 to nine, giving us 1,152 cores and 72 texture units. As the name gives away, the GDDR5 has been halved to 3GB. 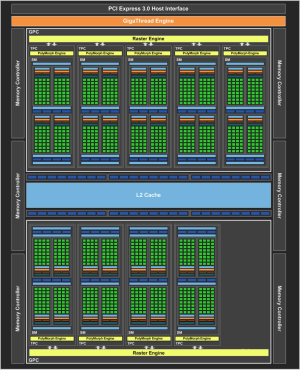 Otherwise, it's the same: 1.5MB of L2 cache, with each 256KB segment of it tied to a 32-bit memory controller and 8 ROPs. 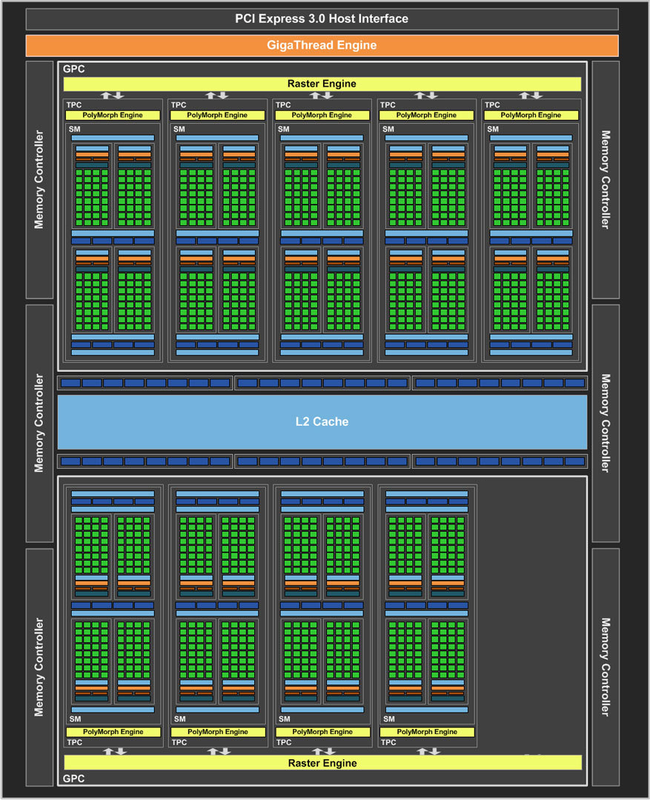 There's no true reference design, but Nvidia's reference clock speeds are the same: 1,506MHz base (1,708MHz boost) for the GPU and 2GHz (8Gbps effective) for the memory, giving us 192GB/sec of maximum memory bandwidth. 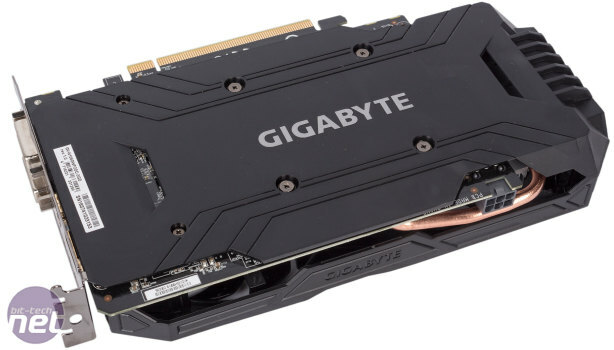 It also lists a single 6-pin PCI-E connector, which is plenty given that the card has the same 120W TDP as the GTX 1060 6GB. 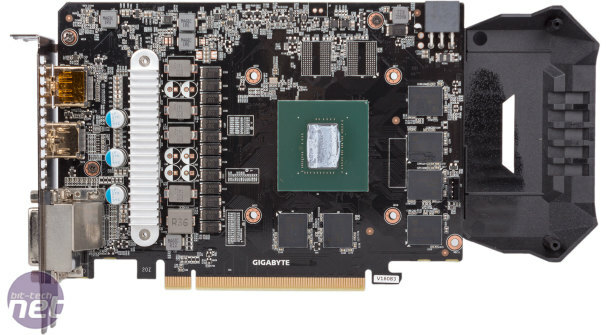 Gigabyte is just one of Nvidia's many board partners, of course, but it has a number of GTX 1060 3GB cards to its name. The one we have in, the WindForce OC, appears to have a decent value proposition. It sports a custom cooler and a factory overclock yet comes in at £200, just £20 more than the least expensive models around. This sort of pricing puts it above most RX 470 4GB cards and in line with some of the less expensive RX 480 4GB cards. As well as having 1GB more memory, both of these AMD cards have more memory bandwidth. There are, of course, more things that contribute to performance than these metrics, but they are potential limiting factors when playing at high resolutions or with ultra settings – only benchmarks will be able to reveal potential bottlenecks. 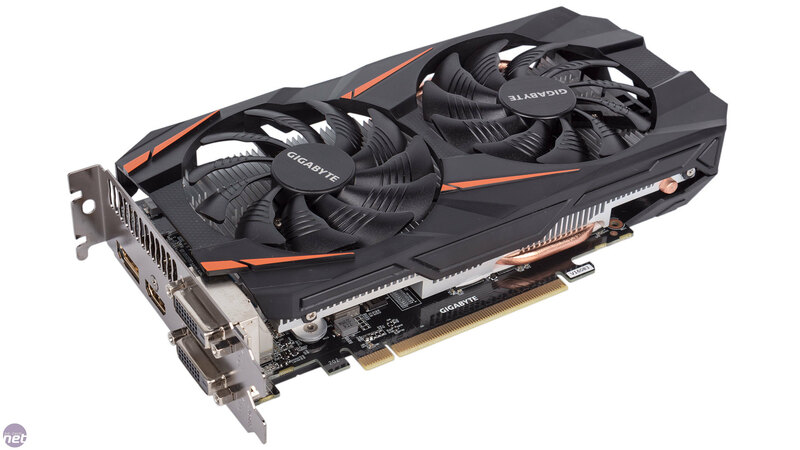 The core of the GTX 1060 WindForce OC is set to 1,556MHz out of the box, but this is easily increased to 1,582MHz by setting the card to OC Mode in Gigabyte's Xtreme Engine software. This is the speed we've tested at, and it gives us a boost clock of 1,797MHz and represents a 5 percent increase over the reference base clock. The memory, sadly, has been left alone and runs at the standard 8Gbps. 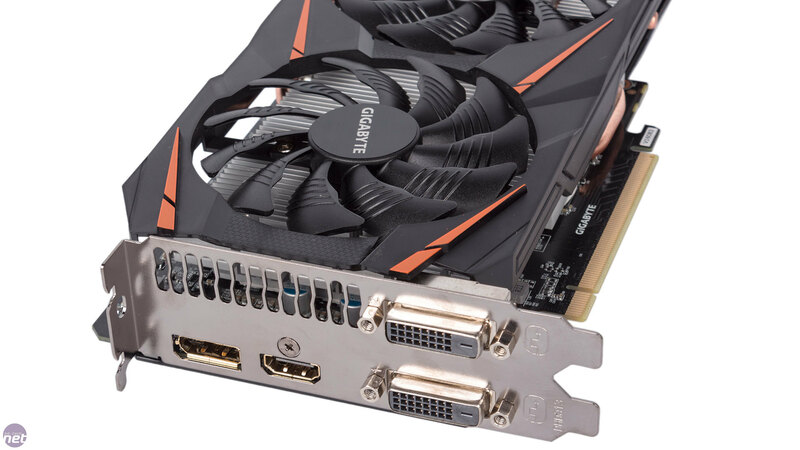 Gigabyte does produce a mini-ITX version of the GTX 1060, but even this dual-fan model is hardly massive. Dual-slot, 223mm long and 121mm tall, it will be an easy fit for the vast majority of cases. 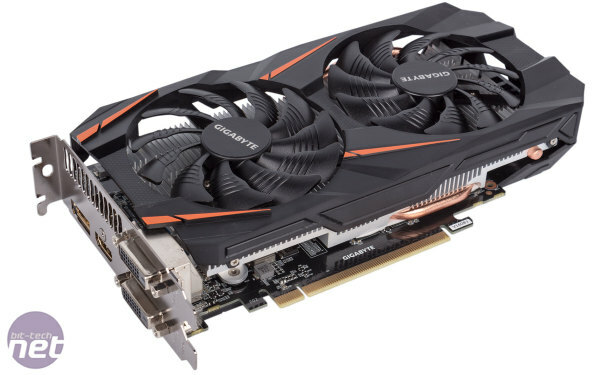 The open cooler shroud is plastic and painted black with some orange highlights, and the card has a metal backplate that keeps it feeling very rigid and improves the looks. 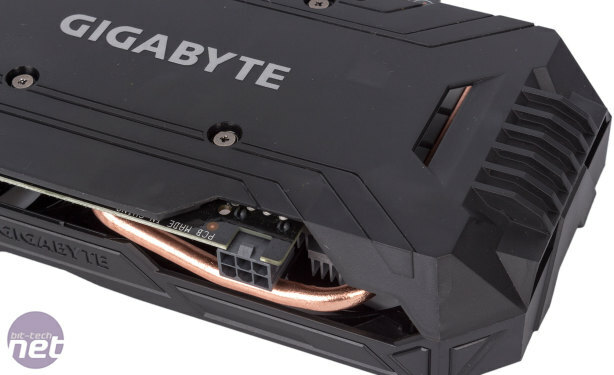 One feature we've become accustomed to in recent GPU reviews is LED lighting (especially RGB), but you'll need to step up to Gigabyte's G1 Gaming card before you see that. You get two dual-link DVI-D connectors; one more than the reference specifications dictate. Otherwise, it's business as usual with one HDMI 2.0 connector and one DisplayPort 1.4 header. Power is delivered through a single 6-pin connector. 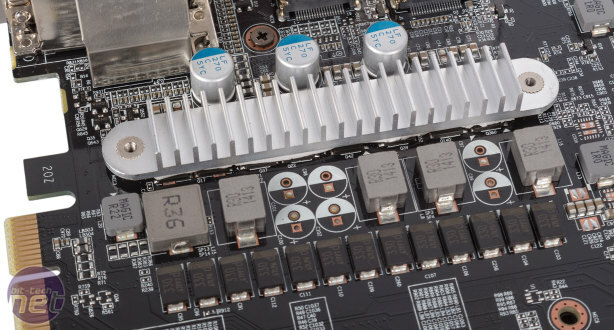 This gives the card a total maximum power of 150W, which is significantly more than the 120W TDP and shouldn't be a limit when overclocking – upgrading to an 8-pin header would only really have been for the sake of it. The WindForce 2X cooler relies on a couple of 90mm fans to drive airflow across the heatsink. 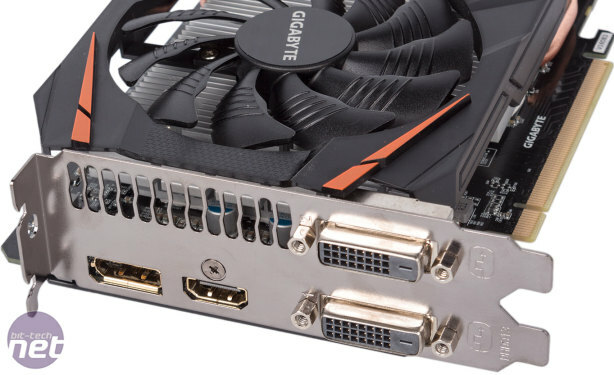 The fans have 11 blades, each with a design unique to Gigabyte with a triangle tip on the front edge that splits the airflow across the channels on the top of the blades. The result, supposedly, is an increase in airflow of 23 percent over standard blades. The open shroud and the direction of the fins mean that airflow will mostly be recycled in your chassis. The fans spin in opposite directions, which Gigabyte says 'optimises' airflow and reduces air turbulence. They're also capable of semi-passive operation and won't spin at all once the GPU is cool enough. 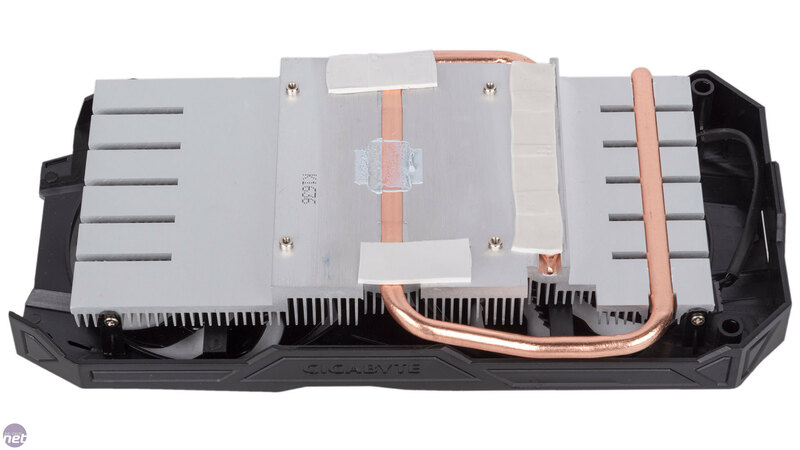 The GPU is cooled by a single, direct contact, pure copper heat pipe that twists back into the aluminium fins. 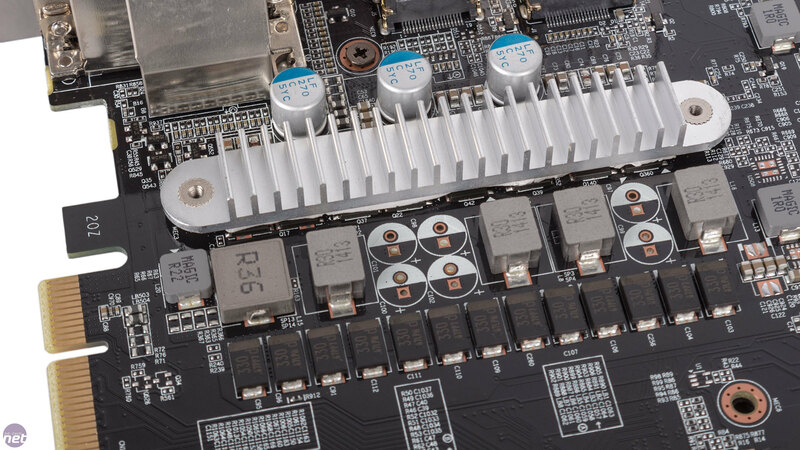 The memory chips are also cooled by the heatsink via thermal padding, and even the MOSFETs are directly cooled by their own miniature heatsink – it's good to see such a complete cooling solution. Gigabyte deploys a 4+1 phase power system for this card, which is a small improvement on the GTX 1060 Founders Edition that uses a 3+1 design. 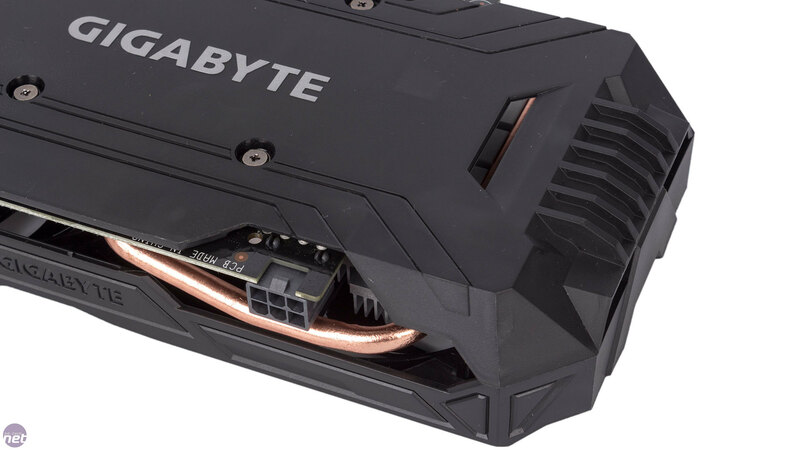 This, it claims, keeps the MOSFETs at a lower temperature and delivers more stable voltage – both of which are potentially useful for overclocking and product longevity. The company also uses its Ultra Durable components, including high-grade chokes and capacitors.